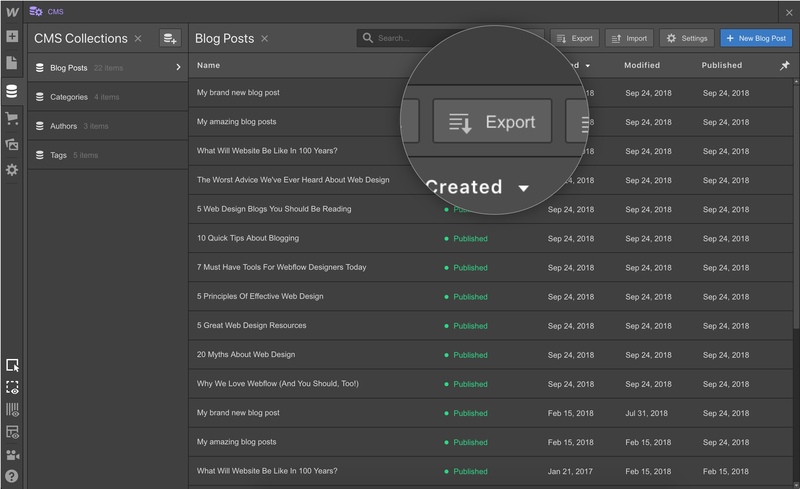 Ever wanted to migrate content from one Webflow site to another? Or needed to move a site to another platform? Well, here’s some good news. Now you can export individual Collection’s content as a CSV right from the Designer — just hop into the Collection and click “Export” for a quick CSV download. Guess what this button does?! Once you’ve exported a Collection, importing that content to another project is a breeze with CSV import. When you export a Collection, your image and file fields are exported as URLs, which link to where those files are hosted from the original source project. This means that if you delete the original project, those links will permanently break. This is also true for image links in rich text elements, which are exported as HTML. If you’re moving a site out of Webflow, we recommend keeping your original project as a backup, and/or downloading these files to your computer, to ensure those links won’t break. Image field: images are extracted from their source URL and hosted anew on the destination project. No need to worry about keeping the old site as a backup. Images in rich text: At the moment, images imported from HTML are replaced with placeholder images, and will need to be replaced manually in the destination project. But don't worry, we're in the process of making this import work automatically. File field: Support for file field import is also coming soon. For more info, check out our guide on exporting a Collection on Webflow University.